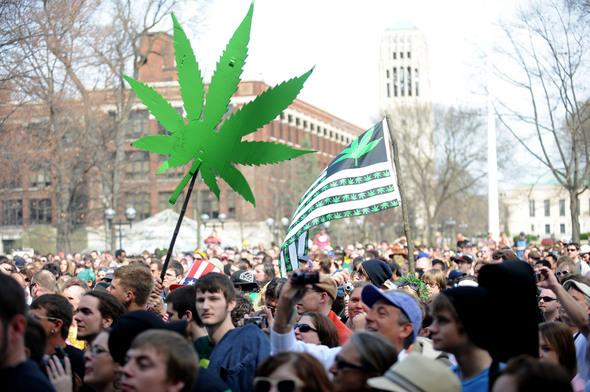 Thousands of partiers filled the University of Michigan Diag last year for the 39th Annual Hash Bash in Ann Arbor. The 40th celebration is at high noon on Saturday. ​On April 1, 1972, stoners gathered on the University of Michigan Diag in Ann Arbor for the first ever Hash Bash, a countercultural cannabis celebration now in its 40th year. The reason for the original Bash was Michigan’s new marijuana law wasn’t going to take effect until after the weekend, so for a brief time there was no cannabis law on the books. 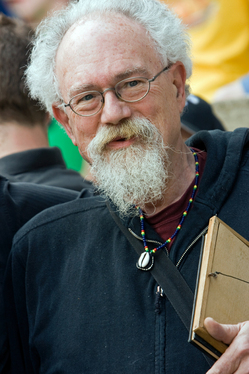 “We kind of wanted to have the Hash Bash to defy this law,” recalled activist John Sinclair, reports Ryan J. Stanton at AnnArbor.com. ​According to Sinclair, activists were marking the occasion when the state lowered the penalties for pot possession from 10 years to one year, and for sales from 20-to-life to four years. “We didn’t think that was far enough,” Sinclair said. Lennon felt a 10-year prison sentence for passing two joints to an undercover agent was savage, remembering his own marijuana conviction in England. Within three days of the protest song being played first at a pro-Sinclair rally on December 10, 1971, the authoritites had released John Sinclair, 27 months into the sentence. Sinclair and others backed two candidates from the Human Rights Party who were elected to the Ann Arbor City Council in April 1972. The two quickly spearheaded a successful effort to reduce the city penalty for marijuana possession to a $5 civil infraction, essentially decriminalizing weed in the college town. That remains essential true today, except that now the fine has gone up to $25. “That totally changed the scene in Ann Arbor, to the point that I know people who used to walk up to cops and try to get that ticket written, and you couldn’t get a cop to write that $5 ticket,” said Adam Brook, organizer of Hash Bash for the past 20 years. Thousands are expected to come to the Diag on Saturday, April 1, for the 40th annual Hash Bash. As in years past, the rally starts at high noon and continues until 1 p.m., when it spills over the the Monroe Street Fair with its live music and vending. Brook said he was expecting a larger Hash Bash crowd than usual this year, with as many as 10,000 if the weather cooperates. He’s predicting a jump in attendance due to increased public interest and media attention surrounding medical marijuana. About 5,000 attended the 2010 event. Besides Sinclair, this year’s speaker list includes former New Mexico Gov. Gary Johnson, a contender for the Republican nomination for President who supports pot legalization. Sinclair said the original goal of Hash Bash was total legalization, and he’s still hoping to see that happen in his lifetime. For now, he’s a state-registered, legal medical marijuana patient, and continues to perform poetry all over the western world, making records, writing books, producing programs for two Internet radio stations and providing musical therapy programs for a medical marijuana dispensary in Detroit. “They need to get rid of this idiotic, hypocritical war on drugs,” Sinclair said. “Marijuana, there’s nothing wrong with it. It doesn’t harm anybody, it’s not a dangerous substance, and millions of people use it — and they’re just characterized as criminals by these people whose drug of choice is alcohol. “So the first thing you get rid of is tremendous hypocrisy,” Sinclair said.